If you’re looking for Mississippi colleges, start with the Rise Up! website. This is a typical, comprehensive site. It requires registration to use some of the tools but registration is free. It has a basic search function for colleges in state with a nice comparison feature. Users can search for scholarships, search for colleges by degrees, and watch career videos. The website contains the usual grade level checklists and requirements for admission into state colleges. It is the first website I’ve come across that actually mentions sports as an extracurricular activity along with the odds of turning pro. There is also a section for students with disabilities that includes contacts for Mississippi colleges’ disability offices. Students can apply for state financial aid through the website. The section on transfers and articulation agreements is currently unavailable. GearUp Mississippi is mainly a collection of resources along with information on summer academies for middle schools students. College Goal Sunday lists upcoming locations and dates for help in completing the FAFSA. The website also has information on College Application Campaign Locations. College Goal Sunday teams up with Get2College to provide FAFSA days in selected high schools. Students and families can visit any of the three locations for free help with test preparation, applications, college selection, and career exploration. The organization also offers resources and workshops for counselors. There are 14 four-year Mississippi colleges with 500 or more full-time undergraduates according to the Integrated Post-secondary Education Data System. Approximately 13 percent of students attend one of the six private Mississippi colleges while 87 percent of students attend one of the eight state institutions. 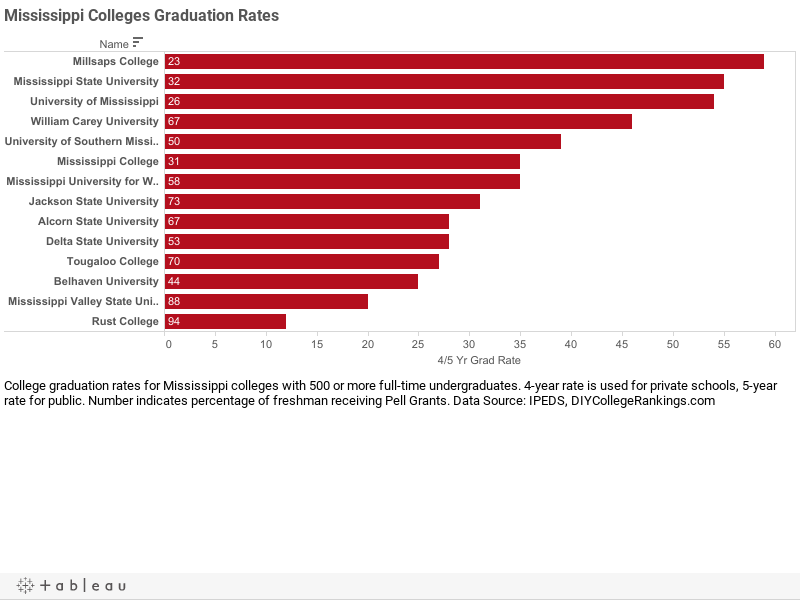 The private Mississippi colleges have an average four-year graduation rate of 34% and the public universities have an average five-year graduation rate of 36.3%. Only three schools meet the DIY College Rankings 50-50 profile requirements. In Mississippi, the average Composite ACT score was 19.0. The English scores was 18.8 and the Math score was 18.3. The 75th% Composite score was 22, English was 23, and Math was 20. A total of 9 colleges ACT 75th% Composite scores were at or above this level.